After a few attempts at baking macarons, my refrigerator still holds a good supply of almond flour. How to use it? 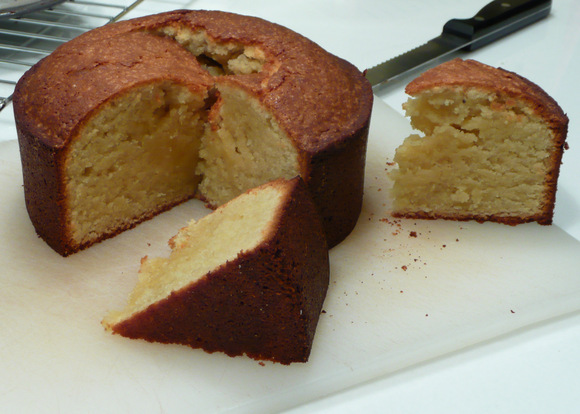 How about some Italian almond cake? This rich, dense cake uses ground almonds instead of flour, making it gluten-free. The seven eggs make it even richer. Unfortunately, the recipe calls for a 9-10 inch springform pan. I didn’t realize that my springform pan is only 8 inches. This caused an unanticipated problem. The cake was supposed to finish baking in about 30-40 minutes. After 50 minutes, a toothpick inserted into the center of the cake was still coming out with uncooked dough attached. The cake was so deep that it wasn’t cooking through! I finally gave up and pulled the cake out of the oven at an hour and ten minutes. After letting it cool, I sliced it open and, sure enough, the center was still very dense and not entirely cooked. The outside edge was a bit overdone. Serving it up with some fresh mango, the cake was still tasty, but I had to eat around the undercooked part. I’ll have to try an alternate recipe, maybe one that makes use of a little flour. I’ll also have to either not fill the pan so high or will need to buy a larger springform pan. This entry was posted in Uncategorized and tagged Almonds, baking, cake, cooking, food by christao408. Bookmark the permalink. I love the look of the mangos. I bet even under cooked in the center, it was tasty! 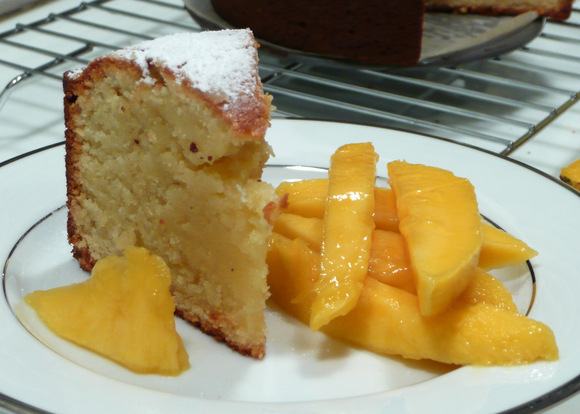 Magoes with the almond cake sounds good, especially those juicy ones from Krung-Thep! I love the mangoes. That’s why baking just scares me. Everything has to be so precise and I’m not a detailed kinda guy. Now I did buy some baking powder, baking soda and also some whole wheat flour. I’m not sure what to do with them yet – maybe some simple muffins to start? Even if certain parts were undercooked, I bet it was tasty- it looks so! @murisopsis – @Dezinerdreams – It was good but I think it was a bit “one note” in its flavor. I’d like to look for different recipes and play around with it more because I love the almond flavor. @LostSock21 – Don’t have one…@yang1815 – Interesting technique. Never heard of that. One potential problem is that without sufficient initial heat, there won’t be any rise to the cake. @kunhuo42 – He he… don’t tempt me, Aaron! =D@ElusiveWords – Stay tuned, Matt. I have a recipe for buttermilk biscuits in the queue on Monday. You can use all three ingredients in it. @Redlegsix – Now that’s the kind of thinking I like. I’ll just need two more pans, then…@CurryPuffy – It is a bit late in the season so these weren’t at their peak. Still, almond and mango is a tasty combination. @yang1815 – ai ya…. you had me scratching my head in puzzlement. You naughty boy! One of the things I like about you is that you’re so comfortable with presenting yourself just as-is.Personally, I look at your cake and think wow, I’d love to eat that, uncooked part and all. The way I see it, a little bit underdone is fine — the difference in texture might be interesting, almost like pudding-filled cake; and it would be delicious.But if I had made this cake myself, and it didn’t come out perfectly, I would have scrapped it. I was talking to someone else too, and when they make something that doesn’t come out perfectly, they don’t post it either. This is what I’m talking about — you’re able to be so up-front and comfortable, even with things that don’t work out right; and I admire that. My last post, the cookies… the first batch I ruined because I wasn’t paying attention to what I was doing when I was making them; and I ended up throwing them away and making a new batch.Anyway, this cake sounds delicious and may be something I’ll give a shot to. Are you going to attempt again soon? @yang1815 – @ElusiveWords – Oh, I see… Being the smart boy you are, Andy, I thought you had some practical, science-grounded reason for the suggestion. LOL@chow@ireallylikefood – Thanks for the nice words. Of course, I’m only posting the blemishes and fouled attempts that I choose too, not the really messed-up ones! Yes, I probably will attempt again in the near future as I still have some almond flour in my fridge. Oh, and one more thing: You actually threw away cookies?! @christao408 – LOL nope not at all, just being naughty! @christao408 – Yes, I know really! I couldn’t believe I threw away the cookies. I think I was just being emotional and frustrated. I sent the whole pan into the trash =/ I should have just kept them at eaten them anyway. I was watching the food network today and now seeing your blog makes me realize I need to start cooking. I seriously don’t know how to cook a meal. Any recommendations for a first cook book for a complete beginner? Well, that picture made my mouth water. I love the flavor of almonds in salads in oriental stir fry and other dishes…..use them often but never instead of flour. After visiting the Culinary Institute of America during my Hudson Valley-NYCity tour, I became more interested in trying new recipes. @Gma_Joyce – A visit to the CIA sounds like a fantastic vacation in my book! Mmmm, I love things with almond flavoring. So tasty :)I’m jealous of the mangoes. I won’t buy mangoes here in the States because after you eat them in someplace where they are actually grown, anything bought here is a severe disappointment. @TheCheshireGrins – Sadly, that is very true Meg. @christao408 – The CIA is a fantastic place with students from all over the world as well as every state. We had a very formal dinner there the day of our visit prepared and served by the students. I don’t usually like squash, but the squash soup they served was the best hearty soup I’d ever tasted. I got the CIA recipe from their website a couple of weeks ago. Now I have 2 quarts plus smaller containers of squash soup in my freezer and have consumed an awful lot of it. I don’t think I’ll get tired of it, but do you have a good soup recipe that freezes well? It’s hard to make just a single serving of soup and don’t like the canned soups.